I have a sweet tooth. A serious, serious sweet tooth. As a kid, my mom managed the sugary contents of our house with an iron fist; that is to say there weren’t really any sugary contents in our house. Well, there was sugar, and I am ashamed to admit that more than once I snuck spoonfuls of the powdered sugar from the baking pantry and grabbed furtive handfuls of the Cinnamon Red Hots my mom kept as a secret ingredient for her holiday-time hot punch. The first time I spent the night at a friend’s house, I opened her freezer to discover pints and pints of ice cream. Just SITTING there. Available for eating…whenever she wanted. Staggering. To be fair, my mom had good reasons to be strict about sugar. My father developed typed-II diabetes when I was a little kid, and she was determined not to let genetics win with me. But the truth is, much like a teetotaler’s kid, I went a little bit nuts with sugar when I achieved the freedom of adulthood. My freshman 15 had nothing to do with beer and everything to do with Chef Roger, who took over my residential college’s kitchen and had a real way with pastry. Those who know me know the affairs I’ve had with various kinds of ridiculous sugar products: Smarties, Bottlecaps, Laffy Taffy (but only the grape & strawberry flavors). Chocolate isn’t safe around me, either. I could SO have been one of those Willy Wonka kids. In the last few years, though, I’ve worked to consciously change my tastes. No more movie-theater-sized boxes of candy or cartons of Ben & Jerry’s for me. Smaller spoonfuls of sugar in my tea, sometimes no sugar at all. It’s amazing how I’ve been able to retrain my palate to the point where I can appreciate desserts and flavors I would have previously overlooked. 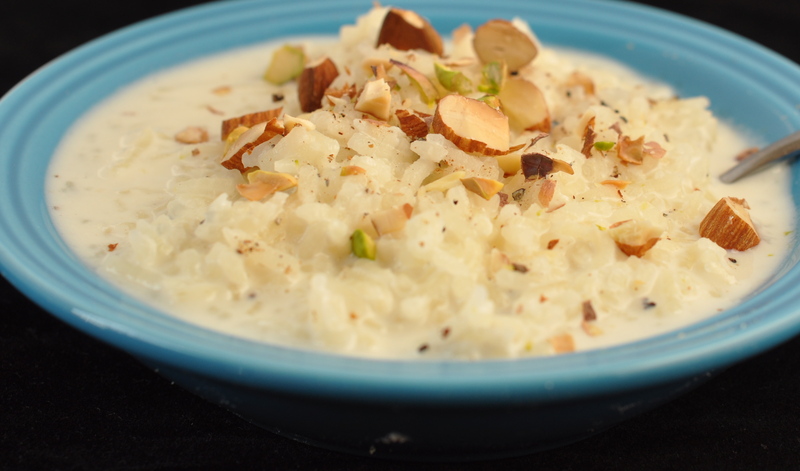 As a kid, kheer never appealed to me—not nearly sweet enough, of course. But now, I love the subtlety of the cardamom and rosewater, tinged with just a bit of sweetness and finished with the salty texture from the nuts. So I’m proud to say that my tastes have become a bit more sophisticated, though I have been known to buy a small bag Laffy Taffy at Walgreen’s every now and then…just don’t tell my mom! Kheer isn’t particularly difficult to make, but it does require patience. Cook it slowly on the stove whenever you’re already planning to be in the kitchen for a while. The best part? Kheer keeps extremely well—in fact, you may even find that it tastes better after a few days in the fridge. ½ cup basmati rice–use the good stuff! Rinse the rice twice while heating the milk over medium-low heat in a heavy-bottomed pot. Drain & add the rice to the milk, stirring to combine with a wooden spoon. When you’ve reached the twenty minute mark, check the rice for doneness. Once it has been cooked through, remove the pot from the heat. Stir in the cardamom, then swirl in the sweetened condensed milk, then check for sweetness—you may want to add a bit more. Serve the kheer hot, warm, or cool. Sprinkle each bowl-full with a handful of nuts and a teaspoon or so of rosewater. *please use 2% or whole milk, it makes for far superior kheer. Nishta — It has been forever since I have been to your blog. Today, though, I passed along your hummus recipe on a discussion board on a Celiac Disease site — there was a write-up about various brands of hummus in stores like Trader Joe’s and I got on to say “Make your own! A great recipe is at this blog! !” So I had to catch up a little bit here to see what goodies you have been making. I like how you make the point about the possibility of re-training one’s palate. I was *just* like you: I grew up in a home where parents were really careful about what sweets we ate, so I went a bit nutball in my early adult years, too. I think some of my health issues now are from going a bit crazy in those days. So I am back to having to be really careful today. If I get to tolerating dairy again one day, you can bet I will be back here to copy down your version of kheer! YUM. I had no idea I loved Kheer until I tried yours. Such an amazing bowl of warm comfort w/ the smell of cardomam to make me smile. I’ve never made this but it sounds like it would become one of my favorite things quickly! I adore cardamom and a creamy rice pudding like dish sounds perfect. Karin–you are so sweet. thanks for sharing the hummus love! and I’m glad to know we’re kindred spirits in sweet tooth history 🙂 I really appreciate your feedback. it’s good to see you around here again. 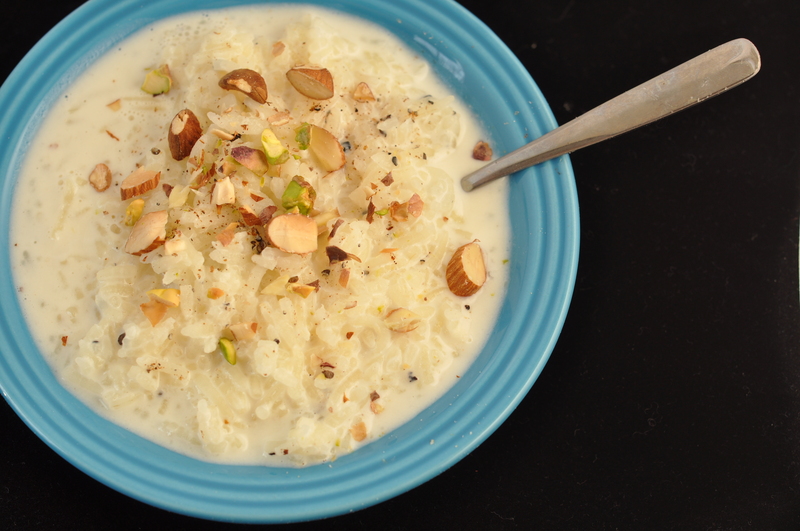 Phoo-D–what I love about kheer is that it’s equally good hot or cold. if ya’ll give it a try, let me know! Kheer is one of my very favorite Indian desserts. It looks so simple to make, I do not know why I have not attempted it before. So do you make your own rosewater or buy it? I saw the article you linked suggested making it like sun tea, and I’ve also seen Alton Brown distill some on his baklava episode–this whole rosewater thing is what’s keeping me from making both of these delicious desserts!! Food Princess–it’s super easy and keeps in the fridge forever! let me know if you give it a try. Tricia–girl, no! I have not yet become that ambitious 🙂 use the store-bought stuff; don’t let that keep you from making the good stuff. Kheer is my favorite! My family makes it with raisins, but maybe that’s just a quirk, because I’ve never seen it with raisins anywhere else. This series is great, Nishta. I never learned much about Indian cooking–my mom’s learned a lot over the years, but when I was growing up, dinner was a pretty Irish-American, boiled potatoes kind of experience–and I’m excited to try your recipes! This is so good Nishta! I think I cooked it a little too long, but it is still exactly what I had a craving for. I love it cold. Katie–I’m so glad you gave it a try! your kheer post is beautiful. I applaud your conquer over sugar! It’s not easy. I spend alot of time in India for work and WOW the desserts are amazingly sweet! Like straight into the “shakes” sugar. LOL. So, I was so pleased to see you write about an Indian dessert that is not sugary sweet. Great post and beautiful writing.